It'll take a few days before we know how Ghostbusters (the much-discussed flick slated for release this Friday) will perform at the box office, but it's easy to get a read on what the public already thinks of it. Head over to Sony Pictures' YouTube channel, click on the trailer and behold: Some 260,000 watchers have given it the thumbs up. And the hater camp? That's just north of 904,000. By now, that number shouldn't surprise anyone. Apart from the specific criticisms of the new film (the all-female cast, charges that actor Leslie Jones' character is a racial stereotype and the charges against those charges), there's the central indictment that Sony is tampering with the sacred. We speak, of course, of the original 1984 Ghostbusters. Panned by critics but adored by fans, to date that movie has grossed north of $295 million. "Ghostbusters never ran out of steam," the new Ghostbusters director Paul Feig said last year. "It's such a great idea. It's such a fun franchise." Well, it's certainly a huge franchise, and perhaps that's the main point. Whether or not fans ultimately choose to embrace the Ghostbusters 2016 movie, one thing's clear: The Ghostbusters brand is going to be just fine. Not only has Sony Pictures alluded to another film coming in 2018, but it's also signed up a slew of licensees—everything from Coca-Cola's Hi-C Ecto Cooler to Build-A-Bear's new stuffed mini Slimer to a Ghostbusters virtual-reality experience at Madame Tussauds in the works. And these newcomers got in line behind Mattel, Lego, Walmart and other Ghostbusters "partners" that already produce and sell a frightening array of merch. Last year, Sony even created a company called Ghost Corps to sign all of the branding deals. What's more, those who think it all began with the 1984 film are technically mistaken. 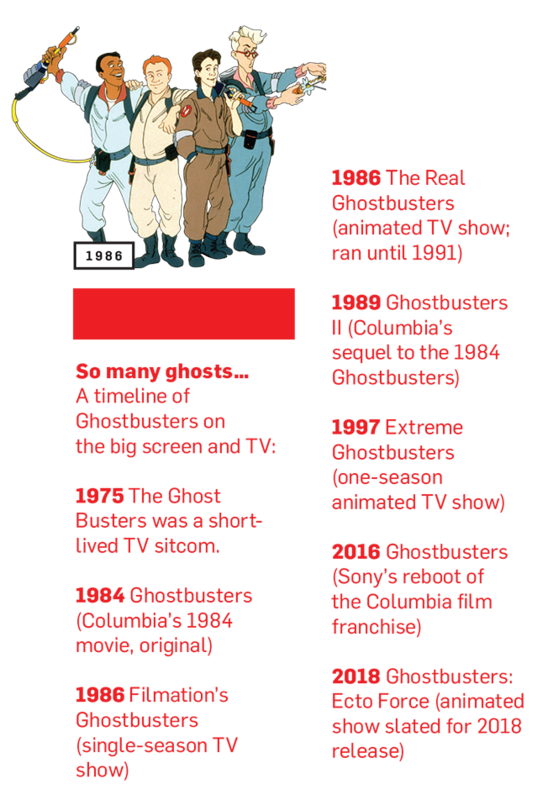 The franchise name actually dates to 1975, when The Ghost Busters was a TV sitcom. After Dan Aykroyd (whose dentist father was a psychic investigator) co-wrote the 1984 blockbuster, it spawned TV knockoffs including The Real Ghostbusters (1986-91) and Extreme Ghostbusters (1997). But Americans never really stopped digging those ghosts. To this day, the "No Ghosts" logo enjoys a 96 percent recognition rate among consumers aged 13 to 54—two full generations of Americans. Sony's all-female reboot of the franchise (top) has raised hackles with hard-core fans of the original crew (above). Controversy notwithstanding, the flow of merchandise (right) has continued unabated. Which might also be evidence that the latest film's cast of characters doesn't matter so much—because, according to veteran entertainment critic Ray Richmond, it's the ghosts who've kept us in thrall for so long. "We're obsessed with ghosts in this country," says Richmond, referencing popular medium James Van Praagh and shows like Crossing Over With John Edward. "We're scared of them and fascinated by them. Ghostbusters is just a buddy comedy; it's the ghosts that are the peg."